1919 Skootamota on exhibition at the National Motor Museum, Beaulieu. After the war, the first new machine to appear was the Skootamota, which did so very rapidly. This was based on the 250 c.c. "Firefly" auxiliary engine, which had been tested in a frame. It was to be manufactured as a light runabout and, as such, a single-cylinder one-speed machine was thought the most desirable contrivance. The bore and stroke was 60 mm. x 44 mm., giving a capacity of 125 c.c. The prototype had 14 in.-diameter wheels with 2 1/4 in. tyres, long handlebars with exhaust-valve lifter on the left, and Bowden lever to operate the contracting band brake on the front wheel on the right, together with a push-button accelerator. A tubular frame was used, having a platform-type of footboard, through which a pedal projected which operated the rear shoe brake. A rather primitive, and probably uncomfortable, shooting-stick seat was provided, whilst the power unit sat over the rear wheel. This had the magneto opposed to the single cylinder, so at least it looked vaguely like a twin, and a fuel tank over the engine which contained about half a gallon of petrol and a small segment for oil. Starting was by the not unfamiliar push-and-jumpon variety, whilst the accelerator was governed to 2-3 m.p.h. in the closed position. This machine was to be made by Gilbert Campling in Croydon, who had up to this time occupied his time as manager of the Selsdon Engineering Co. Ltd., makers of the "Gnat" and "Wasp" engines. Production versions had 16 in.-diameter wheels and a proper sprung saddle, and were turned out of the factory during July, 1919, at a cost of about £40 each. Two other versions of this scooter appeared shortly afterwards: a commercial model with wooden cupboard under the seat large enough to carry a couple of loaves, and a colonial model incorporating a parasol, probably meant to keep sahib cool rather than the engine. A sporting version was not made, although some did show themselves at sprints and speed trials with optimistic ladies at the controls. Probably something like 3,300 of these machines were produced during 1919 and 1920, by which time they had been superseded by post-war more conventional light-weight motor cycles, and with their competitors such as the Grigg, Hack and Tankette served their purpose as small runabouts. The last few hundred had both inlet and exhaust valves overhead. 1920 398cc motorcycle, produced and exhibited under the Sopwith name, owned by Bob Thomas. 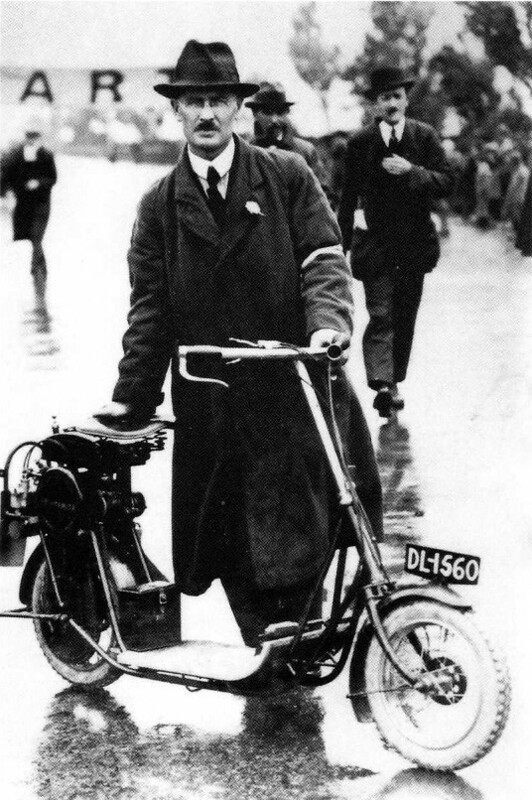 In June, 1918, Bradshaw registered the designs for a new motor cycle completely different to the 1916 model, although embodying several basic principles of the old design. The engine size had been reduced from 500 c.c. to 398 c.c., as it was said that smaller engines had been designed during the war to give as much power as older but larger engines. Steel cylinders were retained, but with a bore and stroke of 68.6 mm. x 54 mm., and the hemispherical cast-iron heads had inclined overhead valves operated by rocker arms and push rods. The two-throw crankshaft ran on ball bearings, whilst the big-ends ran on rollers. A gear-type oil pump fed oil from the sump through an oilway in the crankcase to the con-rods and big-ends, other parts being lubricated by oil mist. A four-speed gearbox similar to the old design was used, although the gate change became much sturdier, and a Ferodo-lined invertedcone clutch was incorporated within the flywheel. All these items were of unit construction, the crankcase being fixed to the duplex frame by four bolts, with the cylinders arranged transversely. 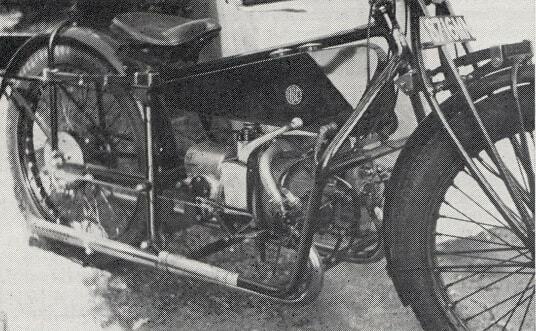 The frame retained laminated springs, but was otherwise constructed to protect the power unit from being sprayed with mud and grit, as well as providing footboards and leg shields for the rider. The tank was reshaped in an angular form, tapering towards the back, and held just over two gallons of fuel. Chain drive was used with the old cush-drive, whilst internal expanding brakes were fitted to both wheels. About six prototypes were made, the first of which took 11 days to complete. This achievement won Bradshaw £1,000, as he had bet that it could be done in under 21 days, a payment of £100 per day being given. These six machines were used by Bradshaw and the other directors, particularly Captain Ronald Charteris, as well as Jack Emerson, who used them in the London-Edinburgh trial. The works' entries usually carried the registrations PA 447 and PA 448. Some difficulty was found in exporting motor cycles to France, and to overcome this they were made under licence by Gnome et Rhône just outside Paris. The French machine was supposed to differ in several respects, but the first one was merely the English prototype with French registration (22151-W-1). Later models did, however, have revised front stands, different kick starters, stiffer springing to cope with the bad roads, and Zenith carburettors. By September, 1920, other modifications included a cranked gear lever and the omitting of the side valances to the mudguards. From black-and-white photographs it would appear that the finish on the French machines remained the same as on the English prototypes, i.e., battleship grey and black. Mr H.H.Burrows on a prototype Skootamota after winning a scooter class race in Westcliff-on-Sea Speed Trials in July 1919. At the end of the war, many aircraft factories carried on producing large numbers of craft for a short while, although it was very obvious that some other engineering work would have to be undertaken even if purely as a stop-gap. The Sopwith Aviation Company was one such firm. 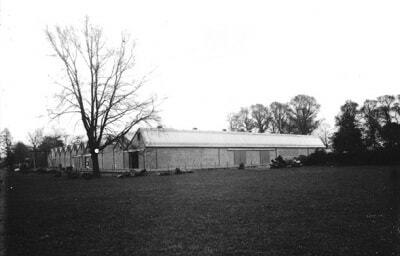 Late in 1912 a roller-skating rink was acquired in Canbury Park Road, Kingston-upon-Thames, where T. O. M. Sopwith, with Harry Hawker and Harry Kauper, built his own aircraft. During the war the business expanded and included the large factory along the Richmond Road, but after the Armistice was a sudden lull. To keep the company going, it was decided to take on the production of the A.B.C. motor cycle, and all the latest equipment was installed for its manufacture. The production version was described in the Press of November, 1919, so it is unlikely that many reached private hands that year. As first envisaged, the finished article should have cost £85, but as first sold the price was nearer £110, and this was soon to be raised to £130. For this price one received a solo machine in its standard finish of enamelled matt-black gunmetal, with a sight-feed indicator and auxiliary hand pump included in the oiling system, whilst a speedo driven from the gearbox was £5 extra, and Lucas lighting set £22 extra. The sidecar chassis and body was listed at an additional £32, which brought the cost of a fully-equipped combination up to £170-190. A kick starter became optional in April, when the speedo drive was taken from the front wheel, whilst some had found their way to India where, with electrics, the solo machine sold for 1,790 rupees. The following month saw yet another price increase, this time up to £150, and later in the year the 1921 modifications were announced, which comprised separate lubricators to each cylinder, a small rectangular tool box fixed on top of the tank, a straight instead of curved front spring, and a new sprung sidecar chassis. Suddenly in September, 1920, it was decided to go into voluntary liquidation while still solvent, the Hawker Engineering Company being set up to take care of the company's aircraft commitments. 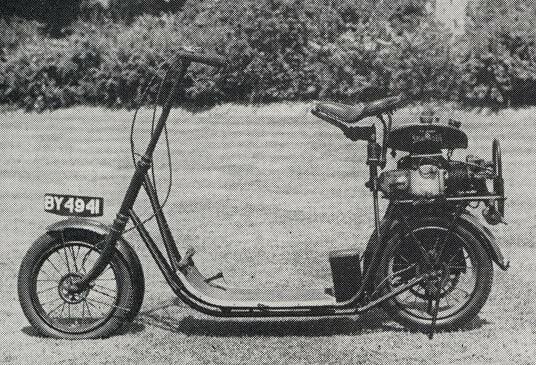 Bradshaw's motor cycle was too original in its design, and therefore far too costly to make and sell at a profit. Although the solo price went up to £150, to make the smallest margin of profit this price should have doubled, and hence a production run of only 11 months. The Hawker motor cycle was produced when the company was reconstructed, but consisted of assembled parts to a great extent. Up until that time, 2,200 bikes had been sold in 1920, and possibly 300-400 during November-December, 1919, whilst the remaining stocks were built into complete machines at a rate of double figures each week until at least July, 1921, some of the last being completed by Jarvis's of Wimbledon. The new 1920 factory at the back of Hersham Lodge. The arrival of the post-war motor cycle had been long awaited, especially by those with a view to competition work, since the prewar model had been so successful. Several events were supported by the works in 1919, including the London-Edinburgh run, the prototype machines being completed only a few hours previously, and not being at all tried. The two riders, Jack Emerson and E. M. P. Boileau (from Gnome et Rhône), both completed the course, which was most encouraging for their first time out. During 1920, the works continued their support, notably with Emerson, and private entrants also had a great deal of success. Outstanding amongst these were Fairley, Applebee Junior and, occasionally Senior, E. A. Colliver, Eric Porter, F. J. Boshier-Jones, H. R. King, and many others. In September, Emerson broke 25 records, including the 50, 100, 200, 250, 300, and 350 miles, and the one, two, three, four, five, and six hours, one hour being at 70.44 m.p.h. At the Southend A.C. speed trials in October G. H. Stewart secured f.t.d. but in doing so ran out of road at the end of the course, hitting some stones and somersaulting. Machine and rider were both unhurt, which spoke well for the construction of the A.B.C. frame and of G. H. Stewart, and both competed in the following event. In France the most consistent riders were Nass, Bergetti and Detruche, although, in one particular Grand Prix, Naas was fined 100 francs for going round the course in the wrong direction! This 400 c.c. machine was well received generally and, although it did not have the top speed of the pre-war model, it possessed vivid acceleration, and was therefore ideally suited to speed trials and hill climbs. One fault appeared common to all machines, that being the frailty of the push rod design, and to overcome this, several conversion kits were marketed such as the Taylor-Young, Jarvis, Inglis and B.E.W. Unfortunately there was never sufficient time to rectify these troubles properly, and A.B.C.s faded out of competition work during 1922-23. In France, the Societé des Moteurs Gnome et Rhône acquired control of the Société Française des Motocyclettes A.B.C. in November, 1920, and continued production until about 1923, also introducing a 500 c.c. model with increased stroke, which had in its standard form a 100 km.p.h. speedometer, an oil circulation indicator, and an eight-day clock. It also boasted light car rims and tyres and voiturette valves to the cylinder head, and sold for the equivalent of £116. Some effort was made for the Sopwith works to be taken over as a going concern, and failing this for the French-built bikes to be imported, but neither of these suggestions ever reached fruition.